This individual Report Anti-Money Laundering Technology is available for purchase. This Report is available to members of Mercator Advisory Group’s Debit Advisory Service. Please be advised that this Report is normally part of a research and advisory service that provides ongoing support throughout the year. As such, this Report contains significant depth of content that is selected for its strategic importance to our members. (For a description of these services, see our Advisory Services section). The Patriot Act is the latest in a lengthy string of government regulations requiring banks to assist law enforcement in fighting crimes by looking for money laundering activities. In this report, Mercator Advisory Group examines today's AML technology environment, including the dramatic changes brought on by the Patriot Act. Additionally, the report examines the likely drives of change in AML technology over the next few years. Anti-money laundering legislation goes back to the Bank Secrecy Act of 1970, and technology solutions to assist banks with their compliance needs go back to the 1990's. 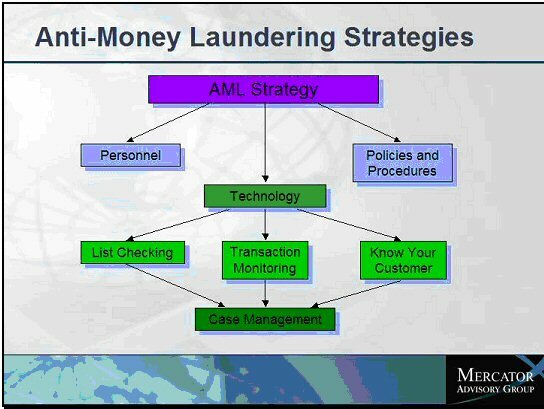 Several factors have converged to dramatically alter the landscape of AML technologies in the last few years. First, the Patriot Act changed both the universe of activities banks were required to monitor for, and also the universe of institutions that are now required to comply with federal regulations. Second, the penalties for non-compliance have risen dramatically. In the mid 80s, compliance was seen as basically optional, and banks made little effort to fulfill their obligations. A $500,000 fine against Bank of Boston changed that. Even that penalty looks trivial now, as Riggs Bank paid $25 million and AmSouth paid $50 million to settle compliance violations in 2004. These penalties are not going to decrease any time soon. This report discusses the four parts of an AML technology solution: Know Your Customer, List Checking, Transaction Monitoring and Case Management. The three major forms of transaction monitoring (rules0based systems, neural networks and peer comparisons) are compared and contrasted in significant detail. the report further analyzes the current market for AML technology, including its size and structure, as well as the current state and significant developments within the vendors that provide these services. Brian O'Keeffe, Senior Analyst in the Emerging Technology Service for Mercator Advisory Group and the author of the report comments, "Since the passage of the Patriot Act, banks have been rushing to comply with the myriad of mandates sprung upon them. Now that the final rush is over, the industry will switch its focus towards making its MAL programs into something more than just cost centers. The first wave of this change is already upon us: integrating AML into risk management solutions in preparation for Basel II. The second, using all of the data gathered under 'Know Your Customer' to better market to and serve customers, will be a significant issue over the next few years." The report contains 30 pages and 5 exhibits.